RSM has come a long way in Canberra, since it arrived 30 years ago. Much has been said about its early beginnings above a fish shop in Braddon with one mad keen accountant from Western Australia, Garry Lee, who, with vision and passion for his clients, grew the business to one of the region’s largest firms with over 100 staff. Now RSM has made the move from their Northbourne Avenue office to larger, more modern, architecturally designed, purpose built premises in Deakin, they are set to take Garry’s vision to the next level. “We want to show our clients and potential new clients that we are investing in our staff and their environment so that we can continue to attract and retain the best people possible,” Frank Lo Pilato, Managing Partner RSM Canberra office, said. Frank says that he also believes it is what their clients and local businesses expect from a firm that, many of them have grown up with and, is part of the world’s sixth largest audit tax and consulting network. “Our new offices are great for the RSM team. Two of the things that are important to me in the new location are: the great new reception area and the fact that all services are now on one level rather than split over several floors,” Frank explained. The fitout and move to the new offices was coordinated internally by RSM Partner, Rhys Kyburz. “I would like to thank Rhys, personally and on behalf of his colleagues, for the great job he has done in coordinating the move and for excellent new facilities we now have for RSM in Canberra,” Frank said. Rhys says that he is very pleased with the move and fitout and that he was fortunate to work with an excellent team to achieve a high quality outcome. “It was great to work with builder SHAPE Australia and designer DJAS who both did a superb job in bringing our $2.8 million project to completion,” Rhys reflected. According to Rhys, DJAS were great designers to work with. “We explained what we wanted and DJAS came up with a design that delivered a built working environment that we all really want to work in,” Rhys explained. DJAS also met RSM’s brief of keeping their office light, open, stylish and professional. “The staff and client areas designed by DJAS are befitting of our new brand, image and position in the market,” Rhys stated. Amongst other features the new office has a central meeting point that brings the RSM team together; Polycom video conferencing; operable walls so that spaces can be created; quiet areas for staff and motorised sit/stand desks for all. DJAS interior designers Alisa Moss and Monica Wojtaszak worked closely with Rhys to develop a workplace which, through its spatial plan, would reflect RSM’s loyalty in improving their staff’s working environment. The open work areas give staff full access to natural light, with offices and meeting rooms sparsely positioned to avoid blocking out the glazed perimeter of the building. Informal meeting areas have also been introduced throughout the fitout to encourage staff collaboration. “We wanted to future-proof our work practices,” Rhys said. Rhys also wanted to thank key members of SHAPE Australia: Ben Wright, General Manager; Tom Hill, Commercial Manager; Jason Matthews, Site Manager and Victoria Ward, Project Coordinator. “SHAPE Australia guided us through the process and monitored everything all the way through. Their attention to detail and follow up before during and after was very valuable. They kept people on site to make sure everything was ok right up to the very end,” Rhys outlined. Rhys says they were very lucky that Capital Veneering, a multi-award winning local company, could do all of the joinery in the new office. The role of Evri Group was to project manage and oversee the entire delivery of the Project including the engagement of all consultants and builder and to liase directly with the team at RSM. The role was made easier as Evri group are the building owners and also negotiated the lease with RSM. Making the transition into Equinox Business Park was very smooth. “My direct contact was Chris Malegan as the PM and we worked extremely well together,” said Rhys. Rhys also would like to thank Jane O’Connor and Peter Sarris for their roles in getting RSM to Equinox. Greg Gill Electrical has a long standing relationship with RSM and undertook and delivered the seemless task of transitioning the move from RSMs existing premises to Equinox. “Greg and his team did a great job integrating and reticulating cabling for the workstations, server racks, networking and Wi-Fi and was tasked with design overview of critical systems. Their experience and knowledge was a great asset,” Rhys explained. 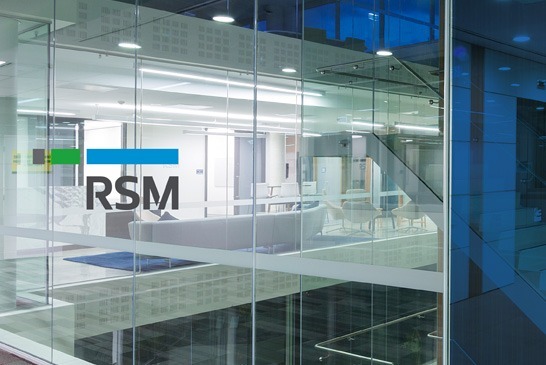 The new RSM offices in Canberra has created the benchmark for all other RSM offices around the country. “At RSM we understand and deal with the full spectrum of a business’ life cycle and our R&R team are at the fore front of assisting Canberra businesses to navigate through financial trouble. “While we provide peace of mind through taking care of the usual accounting and tax compliance matters, our real value lies in seeking to help you address business challenges and uncover opportunities. RSM Financial Services Australia understand that a variety of factors come into play when it comes to realising your personal wealth objectives. Regardless of the stage of your life, you need advice that is sound, practical and relevant to your personal circumstances at that point in time. Our financial planning consultants advise, plan and manage the affairs of thousands of Australians including individuals, SMEs and large institutions. They work closely with clients to anticipate changes in financial demands and take advantage of new opportunities with a financial pathway constantly tailored to individual needs. The world is changing rapidly. With constant advances in technology, communications and infrastructure, barriers are disappearing and the business landscape is becoming more global every day. and who will continually look for new opportunities for your business,” Frank Lo Pilato, Managing Partner of the Canberra office, said. RSM is one of the world’s leading audit, tax and consulting networks. RSM builds strong relationships based on a deep understanding of what matters most to their clients. They take the time to understand their clients business, strategies and goals, and draw on the power of their global network to deliver insights tailored to their clients precise needs. “RSM offers a complete range of end- to-end consulting services that support business transformation programs. Our consulting professionals are experienced in a range of disciplines that assist our clients with governance, change, performance optimisation and risk management. “By sharing the ideas of our senior professionals, we empower people to move forward, make critical decisions with confidence and take full advantage of the opportunities on the horizon for their business,” Frank said confidently. When clients work with RSM, they have access to RSM’s worldwide network of audit, tax and consulting firms. Together, they provide their clients with skills, insights and resources, and a commitment to helping them achieve their goals. “We bring our clients the insight and experience of our global team to help them get to where they need to be,” Frank outlined. In Australia, RSM boasts a national network of 29 offices which, combined with over 90 years experience, has helped them develop an extensive understanding of Australian business trends and conditions. The RSM network spans across 120 countries, 763 offices and enables clients to enjoy access to world’s best practice, insight and expertise. When you’re under pressure, you want to explain yourself once, to one person. So we ensure you have one trusted senior contact who will connect you to a well- informed team, exactly when and where you need them. “We devote a great deal of time, thought and energy to understanding you and your organisation. We will immerse ourselves in your business so we know who you are, what you believe in and what motivates you,” Frank explained. A client’s management team will receive high quality feedback on issues that are pertinent to their business, together with personalised reports and advice from experts in their sector. The partners of RSM know each other extremely well, thanks to frequent cross- border and cross-service line meetings. This means that partners can personally consult colleagues, and draw on those close relationships to get their clients quick answers and fast decisions. “When you work with RSM, you have a team of advisers who are constantly looking out for your business interests,” Frank explained. Based on a 360 degree analysis of a client’s markets, laws and customs, RSM will identify opportunities and challenges before they arise. RSM can help businesses with all their professional services requirements, including the mainstream areas of audit, tax, risk advisory, business advisory, restructuring and wealth management. As well as these core services, RSM also offers a wide range of specialist services, such as management and IT consulting, legal advisory, forensic accounting and human resource consulting. “Our Canberra team specifically offers a full suite of specialist corporate and business advisory services, with experience in most industry sectors,” Frank concluded. In 2016, RSM Australia has been voted by our clients as a finalist in the Financial Review Client Choice Awards in the categories of Best accounting firm (revenue $50m to $500m) and Best WA Firm. RSM is the largest mid-tier accounting firm in Australia that has national ownership and profit sharing. All other mid-tier accounting firms are federations. RSM Australia is a core member of the RSM network. RSM is the 6th largest network of independent accounting and consulting firms in the world. In 2015, RSM won the Network of the Year at the International Accounting Bulletin Awards. Nationally RSM has over 1000 staff. Throughout the RSM network globally there are over 38,353 staff. RSM operates out of 29 offices throughout Australia. Internationally RSM is affiliated with firms in 763 offices in 120 countries around the world. RSM currently have 95 partners and 38 principals. Our net revenue for 2014 was $150 million. Annual fee income of RSM International members firms totals US$4.60 billion. All policy direction and strategic decisions are at directors’ meetings. Implementation and day to day management is effected by six executive directors. Open for business; Beames wants you!